I’m a collector of collectible teddy bears and have been for a number of years. My relationship with teddy bears began, of course, in my childhood. As a little girl growing up in a broken home it was my Yogi Bear I squeezed at night to help me off to sleep. After the family dog sent him to a premature grave I adopted another bear and this cycle repeated itself for years. I’ve lost all of those childhood friends and in recent years have adopted the collectible ones to satisfy the little girl in me who still loves bears. I’ve tried to let the bears go. I really have. In fact, just about six weeks ago I looked at the various small congregations gathering around our home and thought it must be time to say goodbye; to find them another home. I estimate there are about 12 in my office, including Nutmeg and his small companion in the image posted here, and as many in at least three other rooms. Within a day of that thought I dreamt about rescuing a teddy bear from a mud puddle. I guess they need me. Do you still have a treasured teddy bear living in your home? 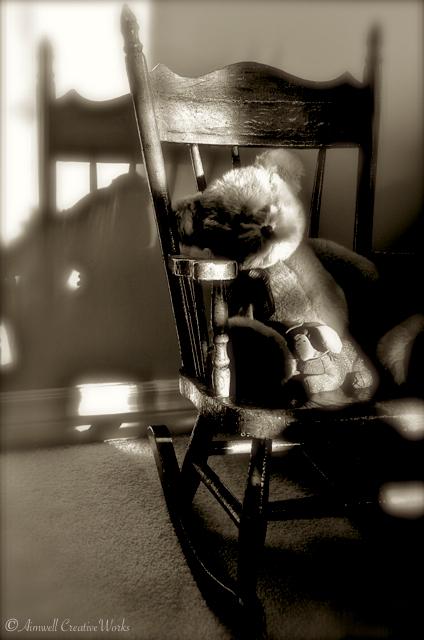 This entry was posted in Animals, Photography, Uncategorized, Writing and tagged Aimwell CreativeWorks, black and white, collectible teddy bears, Dorothy Chiotti, Light and shadow, monochrome, Photography, teddy bears, Yogi Bear. Bookmark the permalink. I love this photo. it’s a memory ! !